GIS tools and remote sensing were used to detect potential breeding ponds. In situ observations validated the indexes. Using ArcView, researchers calculated mosquito density and evaluated cross-potential risks. Fifty years of successful efforts in the prevention and control of infectious diseases and epidemics have inspired confidence and optimism in modern medicine and technology. Nevertheless, epidemics remain a conspicuous challenge to public health today. In the context of climate change and rapidly increasing population, some epidemics are even reemerging. A false-color composite of a 10 m SPOT 5 image (left) and ENVI 4.3 software were used to obtain a new pond index (NDPI). From the NDPI, ponds (in blue) were precisely located (center and right). The 500 m zone potentially occupied by mosquitoes (ZPOM) is shown in orange. For example, the Ferlo region in Senegal, Africa, became prone to Rift Valley fever (RVF) in the late 1980s when virus-carrying mosquitoes Aedes vexans and Culex poicilipes appeared. The latter species proliferate near temporary ponds and neighboring humid vegetation. RVF epizootic outbreaks in livestock cause spontaneous abortions and perinatal mortality. So far, human-related disease symptoms are often limited to flu-like syndromes but can include more severe forms of encephalitis and hemorrhagic fevers. As a result, local socioeconomic resources can be seriously affected. Professor P. Sabatier at the University of Grenoble indicated that this growing threat created an urgent need for a local early warning system (EWS) for RVF epidemics in Senegal. The goal was to use specific GIS tools and remote-sensing images/data to detect potential breeding ponds and evaluate RVF diffusion and areas with potential risks. MEDIAS-France implemented the RVF project in the Ferlo region under the auspices of the French Spatial Agency (Centre National d'Etudes Spatiales). MEDIAS-France is a nonprofit corporation that coordinates research groups studying global environmental issues in areas including the Mediterranean Basin and subtropical Africa. In the Ferlo region, the abundance of mosquitoes is linked to rainfall, ponds and their turbidity, and the presence or absence of vegetation in ponds (e.g., water lilies, wild rice). Initially, Environment for Visualizing Images (ENVI) 4.3 imagery processing software from ITT Visual Information Solutions was used for spectral analysis of high-resolution (~10 m) SPOT 5 images to locate the ponds. First, image registration tools were used to warp the images to match and implement relative georeferencing for all SPOT 5 images collected, with further adjustment to minimize spatial errors. 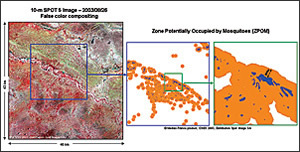 Then, new indexes were obtained by using the classic Normalized Difference Vegetation Index (NDVI) transform tool to allow the combination of different spectral bands (such as the middle infrared [MIR] and the near infrared [NIR] red and green bands). The Normalized Difference Pond Index (NDPI) allowed detection of all ponds; the Normalized Difference Turbidity Index (NDTI) allowed the evaluation of water transparency or turbidity. In situ observations by participants from the Center for Ecological Monitoring (Centre de Suivi Ecologique) in nearby Dakar validated the indexes using GPS and GIS. ArcView conversion, data management, and analysis tools enable the display of an improved three-zone ZPOM for potential Rift Valley fever risks. 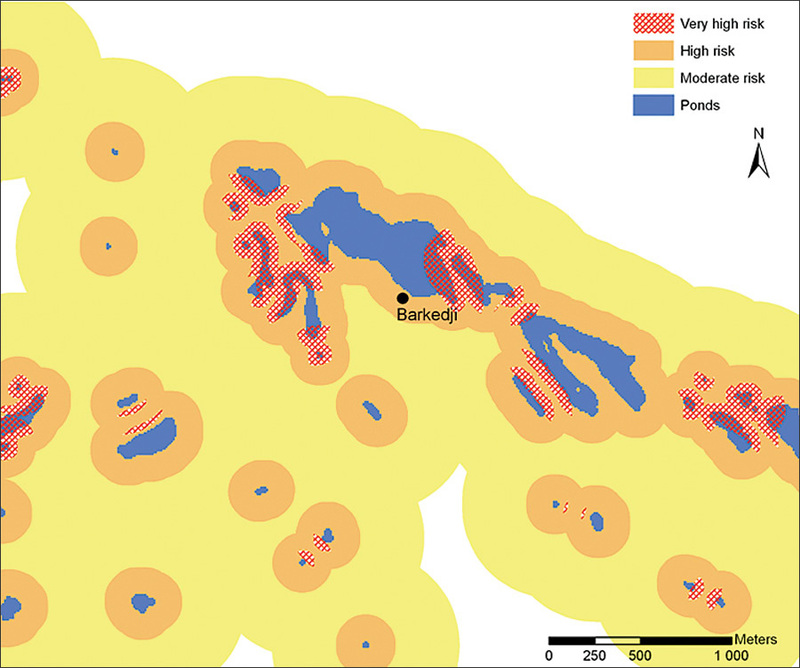 The very high-risk zones are red-hatched to identify underlying pond limits. Using these methods, small ponds were located with precision, making it further possible to map RVF risks from zones potentially occupied by mosquitoes (ZPOM) following recent studies from entomologists on flying ranges and spatial distribution of mosquitoes. Further refinement and simplification were needed, however, because of the complexity of the pond distribution and to develop an effective usage strategy for local health information services. Researchers wanted to identify degrees of risk from isolated and/or clustered ponds, calculate the target risk coverage area, and evaluate risk by mosquito density in overlapping zones. Because of researcher Delphine Fontannaz's GIS expertise and the availability of new detailed information in the zones, the GIS approach became an obvious solution for the team. Using ArcView software and tools (e.g., conversion and data management for spatial projection and transformation, as well as overlay and proximity vector data analyses), maps obtained from SPOT 5 10-meter multispectral resolution imagery were first transformed into appropriate formats, then converted from raster to vector formats. The georeferencing accomplished through universal transverse Mercator (UTM) WGS 1984 for zone 28N permitted further comparison and processing. The initial ZPOM was first divided into three bands chosen for defining risk levels for potential virus transmission by Aedes vexans. Then, using ArcView software, researchers calculated mosquito density and evaluated cross-potential risks. They noted that zones with very high and high risks were inhabited by potential reservoirs, i.e., carriers (snakes, frogs, and toads), of the RVF virus and produced an improved ZPOM. The analyses using GIS technology allowed researchers to see that risks increase when ponds are close to each other. 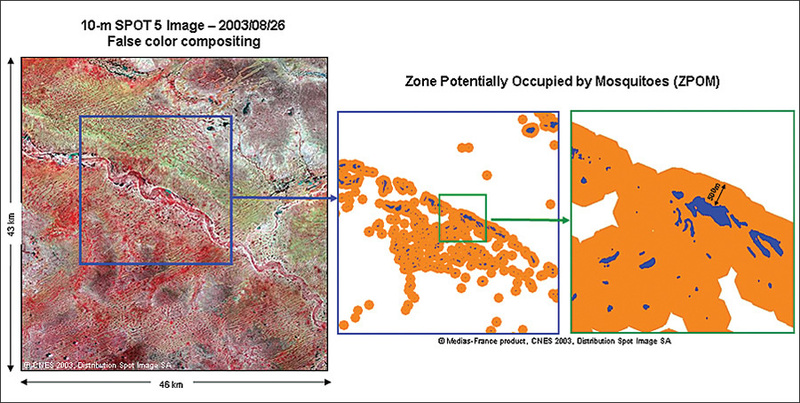 Using GIS technology, researchers created a new, more detailed, and more useful ZPOM. GIS tools provided new products and information for use by local early warning systems in the prevention of disease. This technique might be improved by adding digitized ecological zone layers. Multidisciplinary users can benefit from this data by using it to choose strategic positioning of villages and parks according to RVF risks. This new methodology is also being transferred to other teams in Africa for varied types of mosquito vector research. Tourre, Fontannaz, Vignolles, and Lacaux are affiliated with MEDIAS-France, Toulouse, France; Ndione is affiliated with the Centre de Suivi Ecologique (CSE), Laboratoire de Physique de l'Atmosph�re et de l'Oc�an, Universit� Simon Fongang, Dakar, Senegal; and Lafaye is affiliated with the Centre National d'Etudes Spatiales (CNES), Toulouse, France. For more information, contact Yves M. Tourre at yves.tourre@medias.cnes.fr or visit the Web site at www.redgems.org. This article has been adapted from the Esri e-newsletter ArcWatch, November 2007, www.esri.com/arcwatch, which includes original references.